192.168.100.1: What Is It Used For? 192.168.100.1 is a private IP address that can be assigned to any local network device. It might also be assigned as the default IP address for a few router models. The 192.168.100.1 address can be manually assigned to any device on a local network that's configured to use this address range. This means that it might be assigned to a laptop, smart TV, smartphone, desktop computer, tablet, Chromecast, etc. 192.168.100.1 could also be used as the default address for routers, meaning that it's the built-in IP address that the device uses when it's first shipped out from the manufacturer. 192.168.100.1 and 192.168.1.100 are easily confused with each other. Home networks use 192.168.1.x addressing (like 192.168.1.1) much more often than 192.168.100.x. It's important to type the address exactly as it's shown above. A mistake like 192..168.100.1 will not open the router's configuration page. Opening the above address triggers the web browser to prompt for the router's admin password and username. How Do You Connect to Your Home Router as an Administrator? Administrators can easily change a router's IP address from some other default or custom number to 192.168.100.1. Some might choose to make this change so that it's easier to remember the address for logging in to the router, but there otherwise is no particular benefit to using 192.168.100.1 over any other IP address. Most routers do not use 192.168.100.1 as their default IP address but instead employ 192.168.1.1, 192.168.0.1, 192.168.1.254, or 192.168.10.1. An administrator can choose to assign 192.168.100.1 to any device on a local network, not just to the router. This can be done dynamically via DHCP or manually to form a static IP address. To use DHCP, the router must be configured to include 192.168.100.1 in the range (pool) of addresses that it allocates. 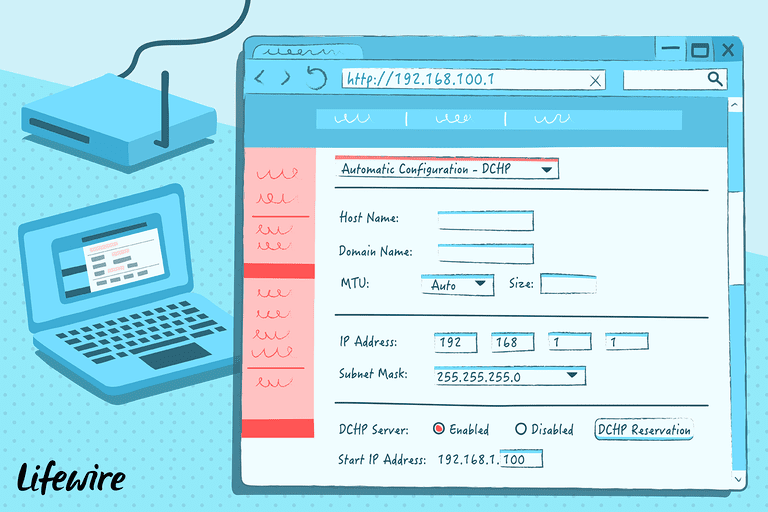 If a router starts its DHCP range at 192.168.1.1, tens of thousands of addresses exist in the range with lower numbers, making it highly unlikely that 192.168.100.1 ever gets used. Administrators more commonly assign 192.168.100.1 to be the first address in the DHCP range so that not only will 192.168.100.1 be used but also 192.168.100.2, 192.168.100.3, etc. With manual, static IP address assignment, the router's network mask must be set up correctly in order to supports the IP address. See our explanation of subnet masks for more information. 192.168.100.1 is a private IPv4 network address, meaning that you cannot connect to the client device or router from outside the home network like you can with a public IP address. Its use is only relevant within a local area network (LAN). The exception to this rule is if your network is using a dynamic DNS service, which will let you connect to the internal network via a publicly accessible hostname. Neither routers nor clients experience any difference in network performance or security from having this address compared to any other private network address. Only one device should be assigned the 192.168.100.1 IP address. Administrators should avoid manually assigning this address when it belongs to a router's DHCP address range. Otherwise, IP address conflicts can result since the router can dynamically assign 192.168.100.1 to one device even though another is already using it as a static address. What Is the 10.0.0.1 IP Address Used For? What is the Significance of the IP Address 192.168.0.100? Does Your Router or Computer Use 10.1.1.1? Is Your Device Using the 10.0.0.2 Private IP Address? How Do You Work With 192.168.1.101 and 192.168.1.x IP Address Ranges? What Are the 192.168.0.2 and 192.168.0.3 IP Addresses? What Is the Default IP Address of a Belkin Router?